If you’re looking for home design inspiration, there’s no better place than Houzz. Houzz is a website that allows users to view home and landscaping projects from all over the world, and to curate their favorites. Users can also ask questions directly to those who worked on the project. It’s a great place to find new ideas. We love Houzz because it allows us to share our favorite projects with a wider audience, and to see what people are responding to. We always enjoy seeing what trends the industry predicts will be big, but seeing what homeowners like and save to their Houzz ideabooks gives us a great perspective. What ACo projects have received the most response on Houzz? Here’s what people have been saving to their ideabooks. The most popular project overall on our Houzz page is the Masthead makeover, and this gorgeous kitchen is one of the most saved images from that project. 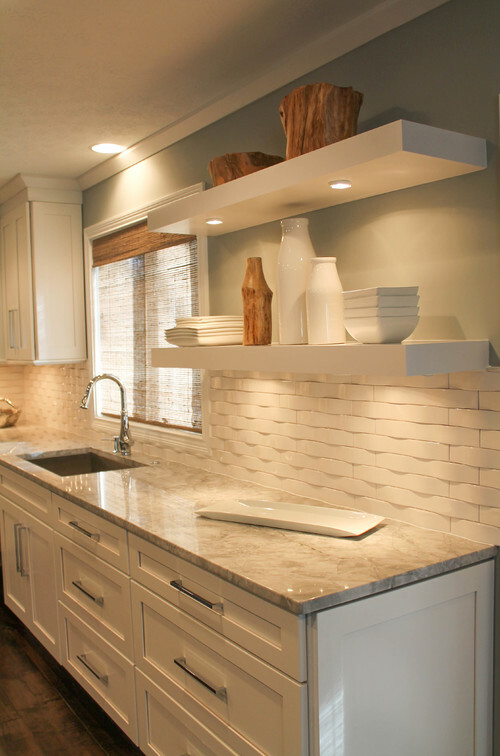 The beautiful white granite and wavy tile make this kitchen stand out, and the updated lighting show’s off the room’s true beauty. 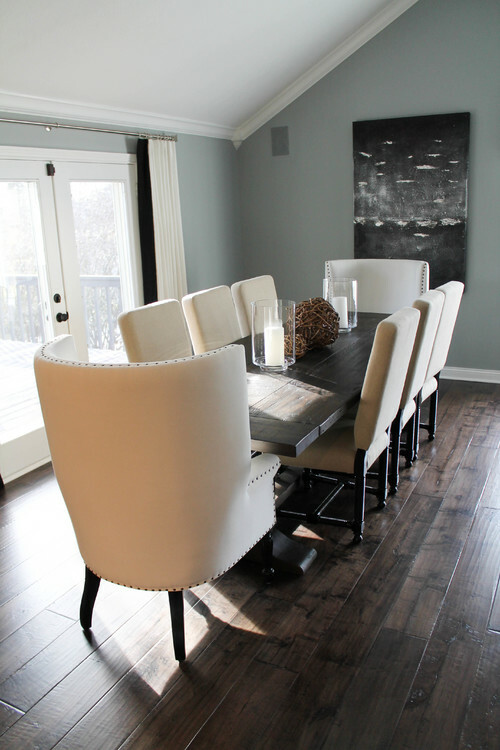 Another very popular room in the Masthead makeover project is the dining room. The rich maple hardwood floor from Johnson Flooring adds warmth to the room and accentuates its rustic charm. You can see samples of this flooring in our Carmel showroom. 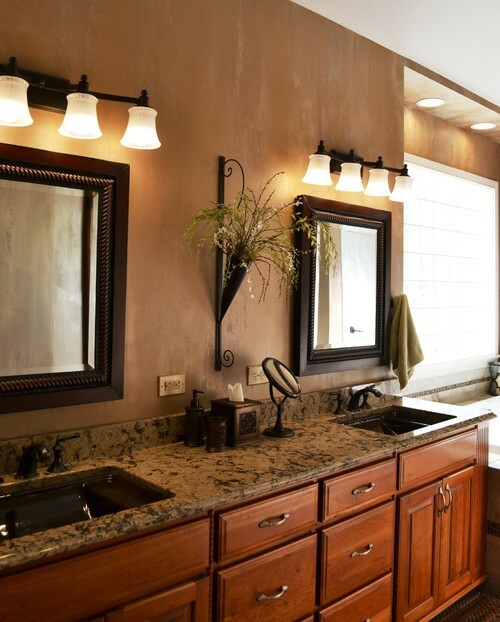 Several of our bathroom projects have been popular on Houzz as well, including this warm, welcoming bathroom. It features lovely wood cabinets and granite countertops. The undermounted sinks are a unique touch that really adds character to the room. 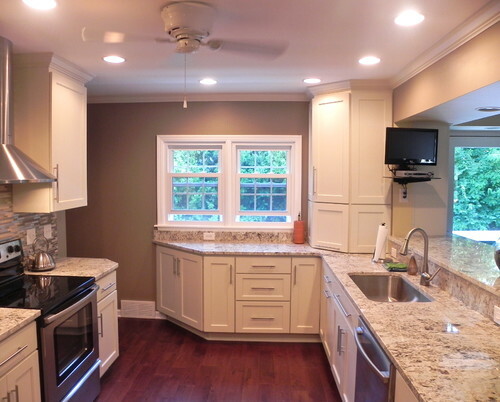 In this kitchen we updated everything: countertops, appliances, flooring, and cabinets. We also added some unique touches, like the stainless steel hood and metal backsplash. The result is a bright and beautiful kitchen that has been saved to many Houzz ideabooks. 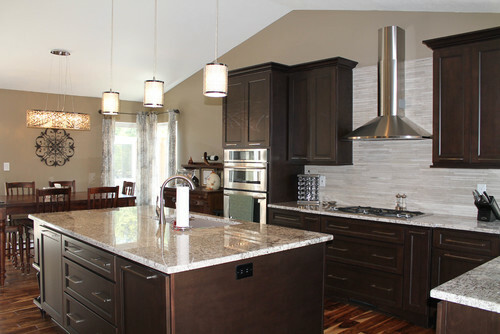 Dark, rich wood has been consistently popular on Houzz, and this kitchen is a great example. The dark floor and cabinets contrast beautifully with countertop and backsplash, and once again we see a stainless steel hood over the stove top. We especially love the stylish lighting in this modern space. If our projects have inspired you, we’d love to talk more about how we can work together to create a Houzz-worthy kitchen or bathroom for your home. Our team will take your ideas and turn them into a project that fits your style, budget, and lifestyle. Contact us today to get started!